KOHBAR, made for marraige purposes. This site is just a display of some of her art and craft. If you want to know more, then come and contact and you will be getting inside a new world of art and its wizdom. Nothing to say more; "Trust thy word, trust thy god." You can see few of the displayed sample of her art gallery. 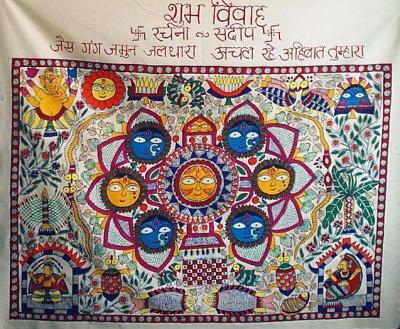 Though There is more to Mithila Art than Madhubani Paintings ,This site invites everyone to get acquainted with Madhubani Paintings - An ancient and celebrated art form of North Bihar, which is also known as Madhubani hence the art of that place is acknowledged as Madhubani painting. Madubani painting is know across the world for its vibrant rich colours and Aesthetic values, this site is to promote mithila paintings and all varied arts of Sudha Jha around the world. As Sudha Jha all alone is trying to bring the best of her art to people and enlightening the world. As an individual she happily declare that she is from Mithila the holy and auspicious land where DEVI SITA(Wife of Lord RAMA) was born. She feels proud of being a Maithil by culture as it is her identity across the globe and want to spread her art from roots of her land to the whole world.